The fourth Thursday in November is a day of celebration across the United States, a day for feasting, for celebrating traditions, family and community. In Sacramento, the fourth Thursday in November is when Hmong celebrate New Year . They celebrate four days, from Thursday through Sunday, at Cal Expo, site of California's State Fair. 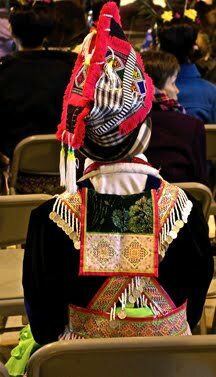 The Hmong view the New year's celebration as a chance to renew their community ties and celebrate their culture. Recognizing its importance in preserving their cultural identity, the Hmong stagger the New Year's celebration to ensure that most of the community can participate. Thus, in California the first New Year's celebration is in Chico in September and the last one is in Fresno from December 26 to 30. Besides the Thanksgiving weekend celebration in Sacramento, there are also celebrations in other communities across California between September and December. A people 5,000 years old that have preserved their unique cultural identity while living amongst more politically dominant cultures, the Hmong have long employed a flexible approach to celebrating New Year. 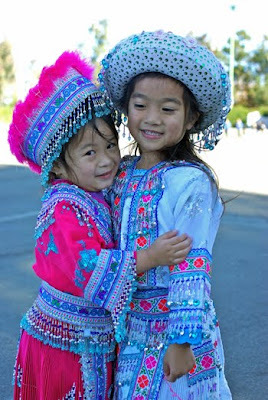 Although their New Year is based on the lunar calendar just as the Chinese and Vietnamese New Years are, in China, where the largest number of Hmong still live, they celebrate their New Year in December to differentiate it from the Chinese New Year. In Laos, where most of the Hmong in the US came from, the celebrations are scheduled around harvests and staggered over a month to allow greater participation. Covering the celebration in Sacramento as one of Foodbuzz's November 24/24/24 participants, I spent several afternoons at the festival. My wife, another friend and I attended the New Year's celebrations Saturday and met several of our students. My wife and I then returned Sunday. We intended to just go Saturday, but my camera battery gave out and we decided we could get some more Hmong barbecue. 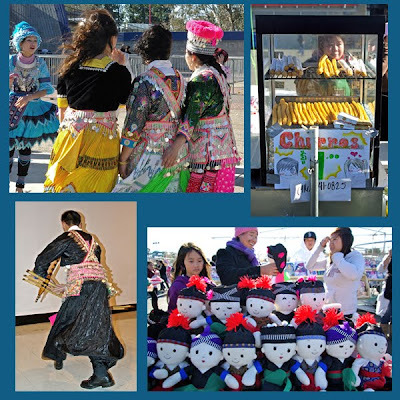 On Saturday we watched some dancing and qeej (pronounced "keng," the Hmong bagpipe-like instrument) competitions. 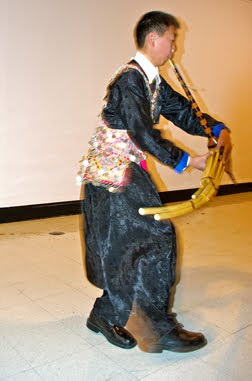 The dancing reflected the global influence on the generation of Hmong growing up in the United States. It ranged from hip hop, to Thai, to Bollywood inspired dances. The qeej are traditionally played at funerals, weddings, and other important community ceremonies. The players spin in circles, dip and thrust the instrument like the horns of a water buffalo, hop on one leg, hooking the leg with the qeej, twist it up and to the side, all the while playing a continuous melodic hum. 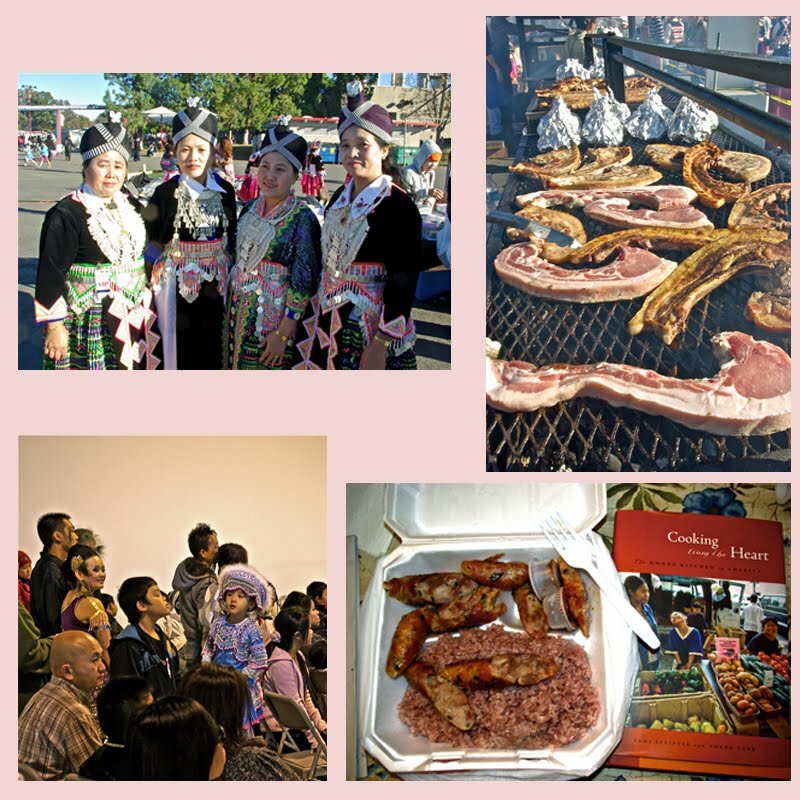 For most of the participants, the New Year celebration is an opportunity to wear their traditional clothes, visit friends and relatives, and eat Hmong barbecue. For young men and women it is a chance to see and be seen. Although both men and women wear traditional costumes, more men choose to wear western clothes, with some wearing conservative suits and others wearing hoodies and jeans. 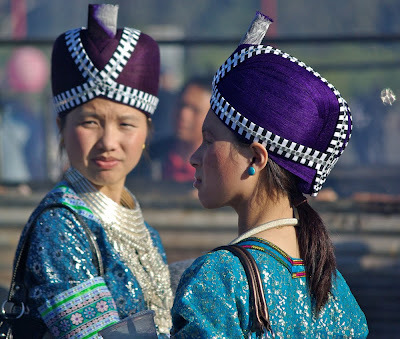 The traditional costumes identify the wearers as White Hmong or Green Hmong, from northern Laos or western Laos. Some younger women put together their own outfits based not on tribal identity but personal fashion preference. Besides offering Hmong dvds, cds, and medicine for sale, kiosks sell traditional jewelry, hats, and clothes. The food was delicious. 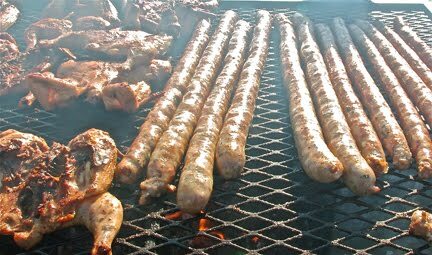 Chickens, Flintstone size pork chops, skewers of meatballs, fish wrapped in banana leaves and then in foil, as well as Hmong and American sausage are grilled over mesquite charcoal. The meats are served with sticky rice and Hmong sambal. Papaya salad was also sold at each of the barbecue stands. Each salad was made to order, resulting in long, slow lines. The Hmong version of papaya salad is much more robust than the Vietnamese version, and spicier and more fragrant than you'll find in most Thai restaurants. In addition to the barbecue and papaya salad, there were stalls selling curry noodles, pho, egg rolls, fried rice and other such fare. In as much as this is the capital of California, there were also churros and even one stand selling nachos of the variety you can find at gas stations. I can't explain this any more than I can explain the success of McDonald's in Singapore. 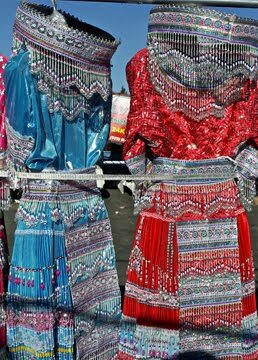 The final Hmong New Year celebration in California takes place next month in Fresno. According to my students, this is the biggest of all the celebrations. There were probably at least 20,000 people who attended the celebrations each day in Sacramento. For a peek into another culture and a chance to taste food that you can't easily find, I would recommend that anyone who is in the vicinity of Fresno from December 26 to 30 to take advantage of the opportunity and go to the New Year's celebration. If you can't do that, try one of the following recipes, or better yet, buy the book. The recipes that follow are adapted from Cooking from the Heart: The Hmong Kitchen in America by Sami Scripter and Sheng Yang. This is an interesting, at times very moving collection of recipes and stories of the Hmong experience in the United States. As an ESL teacher who has often enjoyed many of the dishes featured in the book at class potlucks, I especially enjoyed the cultural and personal stories included in the book. Mix the meat and spices thoroughly. Take a small amount of the mixture and fry it in a nonstick skillet. Taste and adjust the seasonings. 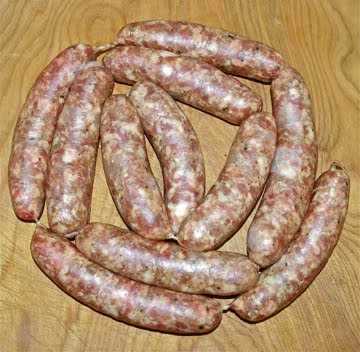 With a sausage-stuffing machine, fill the casing. Don't fill too tight or the sausages will burst. While the Hmong generally make longer links, I prefer 6 to 8 inch links. One of the interesting features of Cooking from the Heart is that many of the recipes are super-sized, appropriate for Hmong family gatherings and celebrations. While this might seem strange, it makes sense when you consider the book's target audience is younger Hmong who have grown up in the United States who long for the food they grew up eating. Their parents and grandparents probably cooked without set recipes and it's hard to pass that knowledge to a generation used to formulas. You might be able to cook green beans for eight, but how about when you're having a celebration and need to cook for 25? This book tells you how. Clean the green beans and snip off the stem ends. Heat the oil to medium-hot in a large, lidded, round-bottomed pan. Toss in the garlic and onion and stir-fry just until their flavors are released, about 20 seconds. Add the green beans and the salt. Stir-fry for a few minutes. Then add the water and cover the pan. Let the beans steam for 5 minutes. Uncover the pan, add the oyster sauce, and stir 2 to 3 minutes, until the beans are uniformly covered with the shiny sauce. They should retain some of their crunch. I made the green beans, cutting the proportions by two-thirds, as an accompaniment to our Thanksgiving dinner and they were delicious. This is an easy dish to throw together at the last minute, as long as you have prepped the beans. The stipend provided by Foodbuzz was more than enough to pay for parking, entrance, and food for my wife, friend, and I. Hunger is serious problem throughout the world and one that gets too little recognition in our media. I donated $150 of the stipend to World Food Programme. Others interested in donating to this organization can click on the badge on the right of this page. Every little bit can help in providing food for those who are in need. 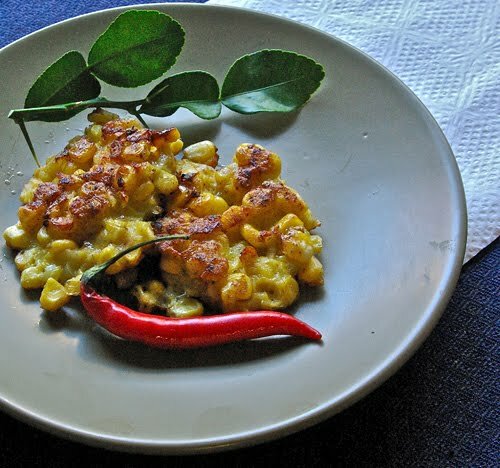 I was thinking the other day that I should have posted about perkedel jagung this summer, when corn was in season. 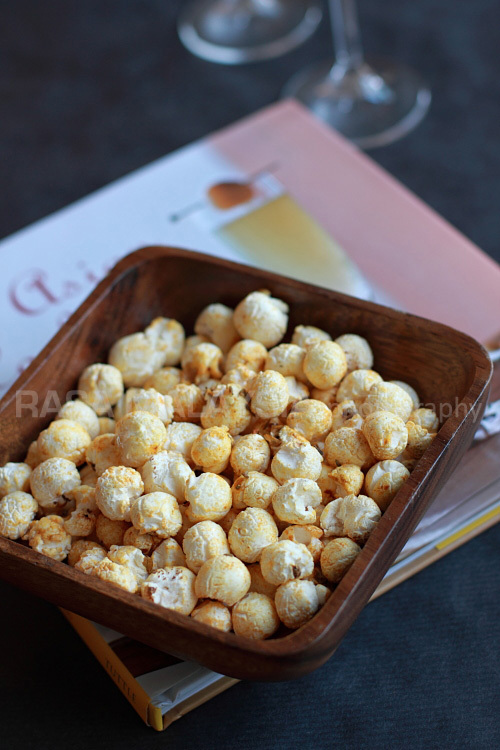 Although it can be made with frozen corn, it's at its best when the kernels are shaved from the cob. I was very pleased then when I went to the local farmers market and found one grower still had corn. I was skeptical that corn this late in the season would be any good, but at four ears for $1.50 I figured I'd give it a try. It was the sweetest corn I have ever tasted, a little too sweet for my taste, but certainly more flavorful than any frozen corn could ever hope to be. 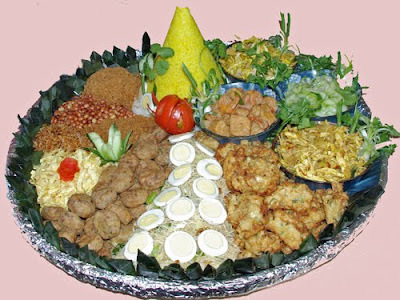 Perkedel jagung are a common side when fixing nasi tumpeng, a celebratory meal featuring a cone of nasi kuning and a variety of dishes to accompany it. Relatively easy to make, good perkedel jagung are all about the corn. There's a little flour added to the spices and egg to bind the fritters, but mostly they're just corn. I prefer to include shrimp, but they taste fine without. Although in Indonesia they are a part of a larger meal, they are perfect cocktail fare. If you wish to have these with drinks, you could serve with Thai sweet chili sauce, some nuoc cham, or a mixture of sriracha and mayonnaise. I prefer them plain, still warm from the pan. When making a batch of these, keep the fried perkedel warm in a low oven while frying the rest. Mix corn, flour, eggs, and spices together. Stir in shrimp if using. Mixture should just hold together. Heat large frying pan and add 1/3 cup of oil. Drop corn mixture by large tablespoon and fry on both sides until brown and cooked. Alternately, you can deep fry. Drain on paper towels and serve warm. My wife has taken up knitting with a small group of ESL teachers a few Sundays a month. This allows me to watch football without too much interference. However, I'm also responsible for providing sustenance for the group. Last week it was savory pies with a butternut squash and leek filling. This week it's apple caramel bars with a coconut cream caramel spiced with star anise and cinnamon. Although I don't make a lot of desserts, I had been wanting to see what caramel sauce would be like if it were made with coconut cream instead of whipping cream. I also wanted to make something with apples for this month's Weekend Wokking. This recipe is for Weekend Wokking hosted by Momgateway. 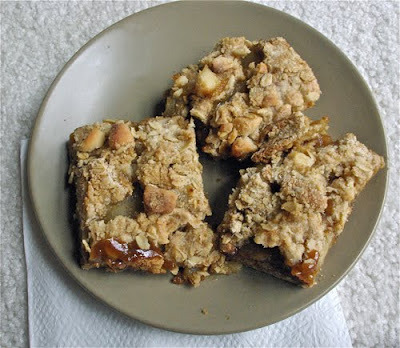 I wanted apple caramel bars with a little bit of an Indonesian flavor. The base and topping are from a recipe that I tweaked from Cook's Illustrated. I had to look around to find a recipe that wasn't simple a shortbread base. I wanted the oatmeal and nuts to complement the apple filling. Macadamia nuts not only have more of a tropical flavor, they also were the nuts I had on hand. Although this was a little sweet for my taste, I thought they were a very tasty bar and would certainly be a hit with kids. In saucepan stir together star anise, cinnamon, sugars and water. Bring to a simmer over medium low heat. Simmer about five minutes. Add coconut cream. The solution will bubble up vigorously. Stir the sauce and lower the heat. Peel, slice and cut apples into pieces about an inch long and 1/4 inch thick. Sprinkle with spices and pour caramel sauce over to coat. Preheat the oven to 375º. Spread apple filling over the prepared base. Sprinkle reserved topping over the filling. Bake in preheated oven for 45 minutes. Remove from oven and cool for at least 15 minutes before lifting out of the pan with the parchment paper. Cut into 12 rectangles. In many countries, the best food comes from nondescript holes-in-the-wall that concentrate on one or two dishes. Instead of the Cheesecake Factory approach of creating a magazine-like menu offering something for everyone, these humble establishments focus on doing one thing right. In turn, the good ones become known far and wide for that one dish. Over time they may add one or two other dishes as a way to increase their appeal, but it's that one dish that draws people to them. In any town you will find people with strong views on where to get the best soto ayam, rawon, gado gado, mie bakso, or rujak, dishes that are often eaten for lunch or a late breakfast. Warungs (food stalls) and rumah makans (the Indonesian equivalent of a diner) can make a name for themselves by doing one of these dishes right. It's not unusual to see businessmen who have pulled up in Mercedes eating at table with a family of four or five that has arrived on a scooter. Rawon is one of those dishes that people will argue over. Essentially a beef soup, it is eaten with rice and garnished with young mung bean sprouts. It isn't commonly found on menus outside of Indonesia because its key ingredient, kluwek, is rarely found on market shelves. 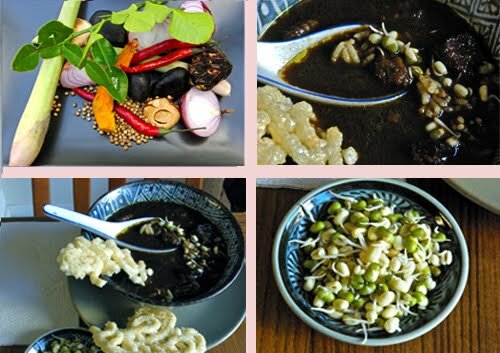 Besides being central to rawon, kluwek--a black, rounded seed that resembles a roughly triangular lump of tar or coal--is used in a some nonya dishes of the straits Chinese. While my attempt at rawon tasted good, I don't think it compares with some of the rawon I've had in Java. Maybe when I go back next summer I'll find someone willing to share their secret to that perfect bowl. Until then, this was still very good, certainly worthy of a winter meal. Boil the brisket in 2 quarts of water with a little salt for one hour. Remove beef from water, reserving water. Cut the beef into 1/2 inch cubes. In blender or mortar, process the kluwek, chilis, terasi, shallots, coriander and turmeric, adding water as needed from what the kluwek soaked in to make a smooth paste. Serve the rawon with hot rice, young mungbean sprouts, sambal terasi and krupuk ikan. 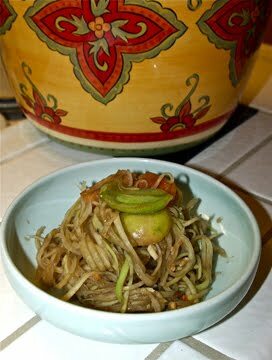 To make the mungbean sprouts, soak a cup of mungbeans in a bowl of water for ten minutes, then drain most of the water. Cover the bowl with a towel and place in a cabinet. Check in twelve hours to see if you need to add more water. Sprouts should be ready in a day or two. As fond as I am of sushi, and seafood in general, it's not something I would normally make at home as one of the members of the household is allergic to seafood. It's a pain to have to prepare separate meals for the different diets, so I generally choose to cook something that everyone can eat. And I don't care how accommodating you may try to be, sushi without seafood ain't sushi. The biggest challenge in making the sushi was finding a time when I was well enough and had enough time to get the ingredients and prepare them on the same day. I think I may have had a touch of the H1N1 a few weeks ago, and then I was at the Foodbuzz Festival in San Francisco last week. During the week I don't have enough time to run to the store between classes and then prepare the sushi. And you don't want to make sushi with yesterday's fish. So I had to put it off to the last moment. I actually made the nigiri sushi and the spiral sushi roll a few days ago when we had a holiday (although I still had a night class to teach). The dragon roll I only got to today. 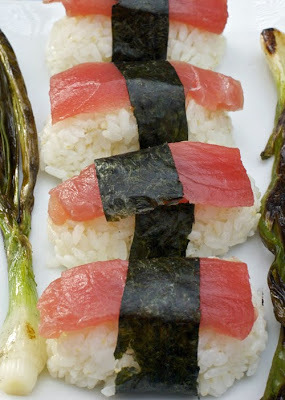 For the sushi rice, I used Kagayaki Haiga brown rice, which is 100% khoshihikari rice. Although a brown rice with considerably more nutritional value than regular milled rice (more than twice the dietary fiber, three times the magnesium and B6, and ten times the Vitamin E), it appears almost as white as regular short grain rice. The taste was very good. The recipes are too detailed to include with the post. They are surely available somewhere on the web, or breakdown and buy a book. The nigiri sushi is topped with salmon and ahi tuna. To accommodate my allergic niece, I made the spiral sushi with char siu, grilled green onions, avocado, and roasted red peppers. For the dragon rolls I pan fried salmon and ahi fillets that had been marinated in a teriyaki style sauce. All of recipes were tasty. Thanks to Audax and Rose for an interesting challenge. Finding good char siu is becoming a challenge. While char siu is becoming increasingly available in American supermarkets, it's tailored to American tastes, lean, sweet, with no nuances. Good char siu should have streaks of fat which keep the meat moist and have hints of hoisin and soy. The best place to find good char siu is in neighborhood Chinese markets where the customers want the fat and the seasoning that they associate with the meat. 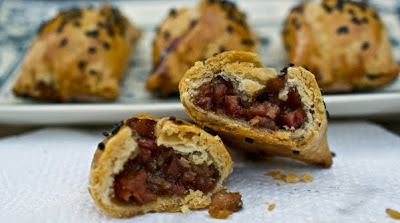 Char siu so bang is a simple pastry to make, one that can be prepared up to the baking stage and frozen until you are ready to bake. Employing the two stage Chinese short pastry dough, it requires some advance planning when making the dough to allow for chilling between stages, but is not difficult to make at all. Once the dough is ready to roll out and cut, the final assembly and baking is quick and easy. The richness of these pastries make them more suitable for a light snack than an appetizer before a meal. They are great with cocktails and would be perfect as an offering at a holiday cocktail party. The recipe is adapted from Ellen Leong Blonder's Dim Sum, a little jewel of a book with a number of accessible, delicious recipes wonderfully illustrated with the author's own watercolors. Combine flour with sugar. Cut in shortening until mixture resembles bread crumbs. Stir in ice water until the dough is moistened and just holds together when pressed. This may require a little more or a little less than 1/4 cup. Turn the dough out on a floured surface and knead just until the dough holds together as a ball. Wrap the dough in plastic wrap and then form the dough into a 5 x 8 1/2-inch rectangle. Refrigerate for at least an hour. Cut the shortening into the flour unit mixture resembles coarse meal. Wrap the dough in plastic wrap and then shape the dough into a 3 x 4-inch rectangle. Refrigerate for at least 1 hour. After both doughs have been refrigerated at least an hour, unwrap the the water dough and place it on a floured surface with a long edge toward you. Unwrap the short dough and center it on top of the water dough, with a short edge toward you. Fold the sides of the water dough over the short dough, with the edges overlapping slightly. Press the overlapping edges and both ends to seal in the short dough completely. Roll out in the direction of the folds to make a rectangle about 6 x 18 inches. Fold the dough in thirds to form a 6-inch square. Wrap in plastic an refrigerate for at least 30 minutes. Unwrap the chilled dough and roll it out again in the same direction to make a 6 x 18-inch rectangle as before. Fold, wrap and refrigerate another 30 minutes. Repeat the process one more time and refrigerate at least another 30 minutes and up to 1 day before the final rolling and shaping. Roll the chilled dough into about a 13-inch square. With a knife trim the dough to a 12-inch square. Divide the dough into twelve 3 x 4-inch rectangles. In a small bowl stir together the sugar, soy sauce, oyster sauce, water, hoisin sauce and sesame oil. Heat a skillet over medium heat, then add the oil. When it's almost smoking, add the shallots. Stir and cook for about three minutes until limp. Stir in the sauce mixture and heat until bubbling. Add the cornstarch slurry and cook for 30 seconds. Remove the pan from the heat and stir in the char siu. Set aside to cool. Place about 2 teaspoons of the filling across the center of each pastry rectangle in the 3-inch direction. Fold the dough over the filling like enclosing a photo in a letter. Press down to seal in the filling on all sides. Crimp the ends with tines of a fork for a decorative seal. Beat an egg yolk with 1 teaspoon of water. Brush this over the top of the pastries. Sprinkle with sesame seeds (I used black sesame because that's what I had in). Bake on an ungreased cookie sheet in a 400º oven for 25 to 30 minutes until golden brown. Cool on a wire rack. Although best served warm, they're still delicious at room temperature.